2015 and 2016 were years of amazing accomplishments by youth across the Pine Ridge Indian Reservation in South Dakota, whom took advantage of the opportunities to help their community, reached for the stars and achieved. Special thanks to our donors, who recognize that an investment in today’s Native youth is an investment in tomorrow’s leaders. Every year I report it has been a great year and the period of 2015-16 was no different. We continued to expand our reach with our Annual Writing and Art Challenge, Youth Summits, the founding and sponsorship of a spectacular TEDxYouth event featuring Native youth and non-Native Youth working together, we helped schools by providing art and books, we ran special projects, went on a trip to Antarctica and made awards of mini-grants throughout the community to support educational and entrepreneurial ventures. 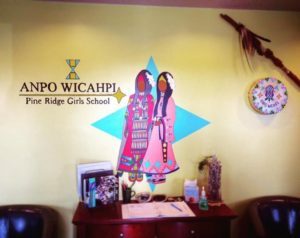 The challenges for the delivery of programs to youth on Pine Ridge Indian Reservation are complex, as geography poses a hurdle to the delivery of services. Unlike many city neighborhoods, when LCE holds a Youth Summit, for example, we must arrange for young people from across a region the size of Connecticut to get to the event — challenging but not impossible — but complicated by a lack of accessible mass transportation. After school programs and service projects similarly involve careful planning and coordination — students simply cannot walk one block or hop a bus to a tutor or another facility — services can be tens of miles away. In 2015 youth participating in our programs had great successes and earned many forms of national recognition ranging from State Service Awards to National Fellowships. 2016, in turn, brought us two totally new partnerships. First, LCE was the major sponsor of TEDxYouth@DinosaurPark, an independently organized TED event, which engaged Native youth and non-Native Youth working together to produce an amazing display of talent. (I was the Founder and Lead Organizer of the TEDxYouth event). Second, the 2014 Foundation invited me to participate in an international expedition to ANTARCTICA and, further, extended the invitation to include a youth leader from Pine Ridge Indian Reservation. As we move forward I am thankful to those of you who understand the importance of providing a hand up to youth in regions where enrichment opportunities are not always available, and most particularly Native youth. Our long-term vision is to provide the services to Oglala Lakota youth on Pine Ridge Indian Reservation and beyond. Thank you for continuing to support our programs in any manner you are able. 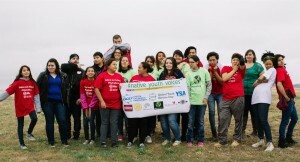 The youth of Pine Ridge rallied and worked together to create an incredible impact. Many were recognized with national awards and scholarships while others followed behind them, helping themselves and the community. We ran summits, service days, built gardens and ran a writing challenge. 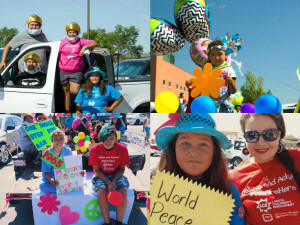 Pictured are photos from the 2015 Oglala Lakota Pow Wow Parade, which had a theme of 1960s Peace, Rock and Roll, Space travel, Moon Walk, World Peace and all that! Team LCE’s float beamed with enthusiasm and the youth participants handed out thousands of BOOKS to the spectators rather than candy –imagine that!! 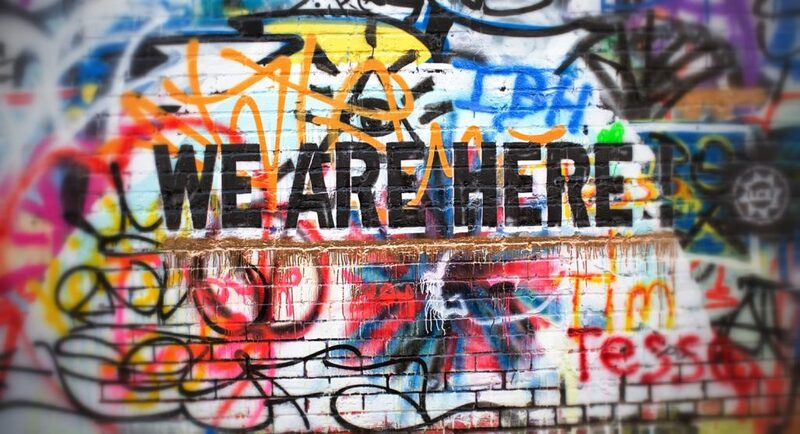 #WeAreHere was the theme of the 2015 Writing and Art Challenge and youth across the Reservation stepped up and wrote and created artwork that has been seen and heard all over the world. If you haven’t done so already, please check out the collections of winning poems and stories on Medium, the online magazine. If you cannot access Medium (which requires a Twitter account), then you can find the content on our website. Enjoy the #WeAreHere Writers and the #WeAreHere Artists. Winners represented the Wolf Creek School, Red Cloud Indian School and the Little Wound School on Pine Ridge Reservation. Following the award ceremony, we held a Youth Summit where participants built community gardens, we travelled to schools to hold spoken word and art clinics and taught youth how to make artwork out of old LP vinyl records! President Barack Obama made it a priority to open doors and to create opportunities to elevate the voices of Native Youth. LCE founder Maggie Dunne and several LCE youth delegates were invited to attend the inaugural Tribal Youth Gathering at the White House. A huge thanks to those who sponsored the travel costs of some of our Oglala Lakota representatives! In addition to all other avenues of amplifying voices, Summer Montileaux (Oglala Lakota Youth Board member) and LCE Founder Maggie Dunne both wrote Letters to the Editor of the New York Times on different occasions and BOTH were selected for publication in the online and print editions of the New York Times! Summer’s entry was one of 16 High School student entries selected for publication in a nationwide competition that yielded 1300 entries! Maggie’s Letter to the Editor appeared in response to a feature article on the suicide epidemic on the Reservation. 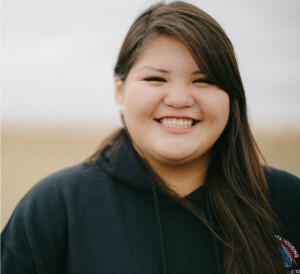 Wiyaka Little Spotted Horse earned a coveted spot a the National Indian Health Board’s Youth Summit, where she produced a film which was selected to be played at its National Conference. She also received a Disney grant for a service project and spoke at several schools, spreading the word about her personal journey of fighting to develop self-esteem and self-worth. At the NIHB Annual Conference, Summer Montileaux received the National Indian Health Board’s 2015 Youth Leadership Award an award presented to the one Native Youth in the nation who has contributed the most to health and wellness initiatives. Summer is a superstar who we’ve written about many times. She will be entering college in September 2017. You can watch the video of Summer’s award presentation and her moving acceptance speech HERE. Empowering Through Education: STEM CAMP! Through a partnership with the Rose-Hulman Institute of Technology, two Youth Board members, Jetta and Savannah, won scholarships to the Bernard Harris STEM Camp held at Rose-Hulman Institute in Indiana. Jetta and Savannah have been active contributors to LCE programs and had the academic standing to win them two coveted scholarship positions at the summer camp. Their camp positions were funded through a grant from the Bernard Harris Foundation. In addition, Rose-Hulman hired mentor Janet Whiting, from Rockyford, to chaperone them on the trip and to work as a camp counselor. LCE recruited and nominated candidates to Rose-Hulman and provided supplemental funding to equip the ladies with proper attire, living expenses and sundries. 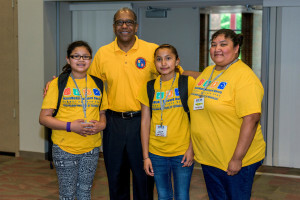 Above, Team LCE is pictured with Bernard Harris, the first African American astronaut — the camp’s benefactor. 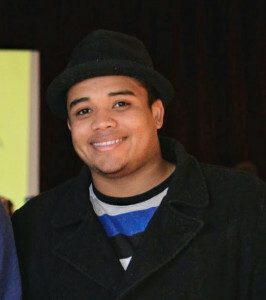 Co-Founding Youth Board member and former Youth Board Chair Keith Martinez earned the highly prestigious Harry S. Truman Scholarship for academic achievement and his service work with LCE. This scholarship will help fund graduate studies and will provide Keith with preferred admission to many prestigious graduate schools. Keith graduated from Villanova University, where he was a Presidential and a Gates Millennium Scholar, and majored in communications. He was also a PPIA Fellow while in college. Youth Leader Bobby Pourier earned a grant from Youth Service America, which in turn partially funded a series of presentations to encourage youth across the Pine Ridge Indian Reservation to stay in school and/or to learn about and celebrate Lakota culture. Bobby earned the title of Youth Service Ambassador for the State of South Dakota for all of his work with Lakota Children’s Enrichment which, in turn, earned him leadership training in Washington DC and a grant to help fund his proposal. 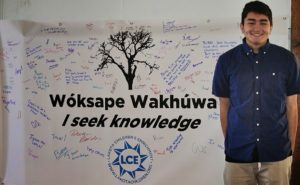 Bobby presented a program entitled Woksape Wakhuwa (Lakota language for “I Seek Knowledge”). Bobby went on the road to several schools with youth and adult role models, whom spoke about the ways that an education helped them excel. They took questions and encouraged everyone to keep learning, in or out of school. At the end of each presentation, Bobby encouraged students to sign a pledge to seek knowledge. As you can see by the above photo from one school, the impact was amazing! Bobby now attends Yale University as a Gates Millennium Scholar. TEDxYOUTH@DinosaurPark debuted in April 2016 in Rapid City, and will return again in October, 2017. This project was the Founded and Organized by LCE President Maggie Dunne, who set out to produce a collaborative platform which engaged Native and non-Native youth to present their ideas worth sharing. LCE is the major sponsor of this annual event. 2016 Speaker highlights include Elyssa Sierra Concha, who earned a standing ovation for her intimate journey and the way that she faces the negative statistics which often define Native Youth; Andres Gallardo, the architect of the “GEM” Movement, through which he “Gives Everyone Moments” though his artwork — he uses art as a means of empowering social justice efforts and improving lives; Tara Rose Weston, a skilled story-teller, who spoke about the Lakota culture and the power of resilience; Khian Norby, an 11-year old emerging rock star who found his passion in the guitar; and SO MUCH MORE!! Please devote a few minutes out of your day to watch the work product! Special props go to all of the other event sponsors: the FILM ROCKERS videography team at the SD School of Mines, Willi White Photography (check out the Flikr Album), The South Dakota School of Mines, Office Depot Office Max in Rapid City, the Performing Arts Center of Rapid City and a cast of over 40 others. Stay tuned for the 2017 event which will take place in Rapid City SD on October 14, 2017. Empowering Youth Through Travel: Antarctica! 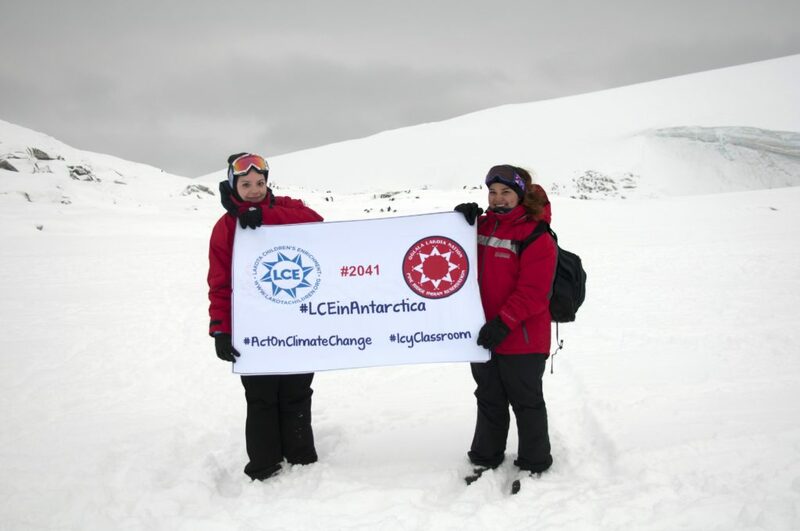 LCE President Maggie Dunne received an invitation from the 2041 Foundation to participate in an expedition to Antarctica to learn about climate change, and was further invited to include a young woman from Pine Ridge Indian Reservation on the trip. After much discussion, in the Spring of 2016 she took off to Antarctica along with Payton Sierra, a youth leader in LCE’s programs and a repeated winner of LCE’s Writing Challenge. Through their almost three-week journey by plane and by boat, they witnessed first hand the impact of climate change on the Antarctic continent. 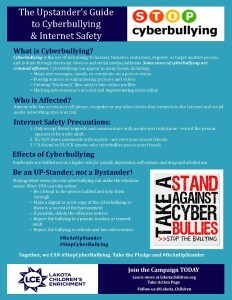 Please check out their blog, photos and page on our website. Many thanks to the 2041 Foundation and the generosity of Board Member Jon Ungar for making this dream a reality! We launched three new programs: the Culture Not Costume campaign, the Anti-Cyberbullying and a Recognizing the Signs of Mental Illness Campaign. Check them out! 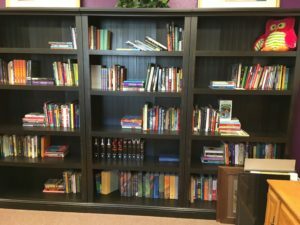 Through partnerships with community organizations and libraries, we have now provided over 100,000 books to Reservation schools and community organizations. At the 2015 Pow Wow we distributed more than 2,000 books and the response was so enthusiastic that we ran out of books before the end of the parade! We made several mini-grants ranging from $500 to $2,000 on a case by case and rolling basis. Grantees included: Rock Band Scatter Their Own (to start up its t-shirt business); College Horizons stipends to fund travel and expenses to increase educational outcomes; STEM Camp contributions for campers to ensure they had adequate gear and and clothing; and the Lakota Girls School a traditional Lakota private school which opened in Porcupine SD (we provided them with books and a donation to assist in start up operations). In addition, we sponsored all of the Tiny Tots dances at the Oglala Lakota Pow Wow in 2015, to encourage cultural traditions in the community for its youngest members who each earned $5 for dancing in traditional regalia! We maintained partnerships with Youth Service America, GenerationOn, Disney and Friends, Scarsdale Rotary and the Rapid City Rotary Club, all of which contributed towards youth projects. In addition, we made new partnerships with TED and the 2041 Foundation. Finally, we gathered additional public support for our programs through national recognition and speaking opportunities. 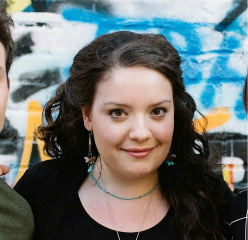 Our Founder, Maggie Dunne was named to Forbes Magazine’s 30 Under 30 for Education, and LCE won a $15,000 “More Than Words” award from Harlequin Books for Maggie Dunne’s work in the philanthropic sector. In addition, Maggie was named an American Express Next Generation Fellow, one of 12 emerging leaders under 40 in the nonprofit and philanthropy sector. Finally, she was invited to speak at venues ranging from the White House Summit on the United State of Women (run by Michelle Obama and Valarie Jarrett), Nexus Global Youth Summits at the United Nations and on Capitol Hill, RFK Young Leaders in NY City, the Rotary District Conference at West Point and many other venues. We can’t all work on a grass-roots level, but we all have the ability to be agents of change. 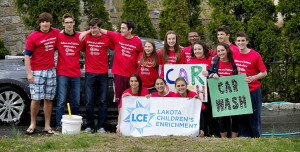 Pictured here is a teen car wash in NY which raises about $1,000 annually for LCE and its programs. We can’t do this without YOUR help. Please consider doing what you can as a volunteer, fundraiser or team member on our next event. 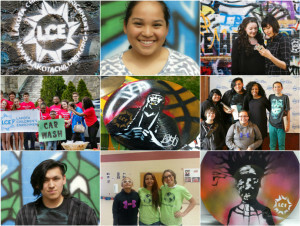 If you would like to join LCE’s efforts to amplify the voices of Native Youth, then please consider making a tax-deductible donation at this link.